Enjoy walking on an almost endless seashore, as some of the highest tides in the world mark the passage of your day. Relax and enjoy the charm of rural Nova Scotia where life is only as busy as you want it to be! Step back in time to the charm and comfort of a log home without having to leave behind the modern conveniences that make for easy living! Commanding a panaoramic view of the Minas Basin and its rugged shores these cottages offer excellent saltwater swimming and surf fishing practically at your door step. Golfing and freshwater swimming are available within a 10 minute drive. 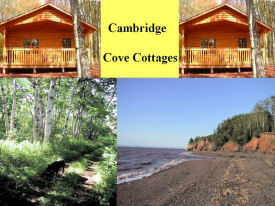 Whether you are seeking a place to shut down and relax on a very private beach, or a base from which to enjoy day tripping for white water rafting, fossil tours,lobster dinners, theatre, golfing (4 courses within 100 KM) or general sight seeing, Cambridge Cove Cottages has something for everyone! A perfect spot to vaction. 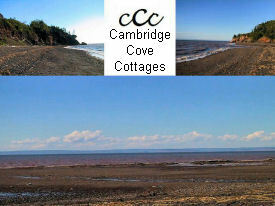 For more information, please visit www.cambridgecovecottages.com.